There is a choice every leader must make about whether they want to be the type of leader that drives development or stifles it. A Belief that People Want to Do Their Best. This belief is internal and what is used to define systems with the thought that people wake up every morning wanting to do their best. 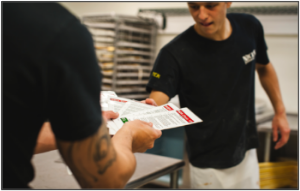 One of the systems that support this belief at Nick’s Pizza & Pub is our Ops cards system. These cards define all of the daily responsibilities that each work group has and is based on the honor system. When a team member completes their card they turn it to green and essentially sign a contract saying they have completed everything on the card. Explicit Purpose and Values. Having a clear, specific Purpose for the organization and a clear set of Values defined drive behavior and are essential in recognizing the positive behaviors we want to see more of, instead of catching the wrong. Reciprocal, Clear Feedback System. Feedback processes that encourage supervisors to coach in the moment, so that the team members understand immediately whether a given behavior is on or off purpose. The objective here is not to call out “bad” behavior or violations of the rules, but rather to make the most of mistakes as learning opportunities. A System of Advancement. This is not based on seniority per se, but on participation in our extensive certification program. All raises and promotions are contingent upon performing well and being certified in a certain number of roles or positions around the company. In general fostering a culture of learning. How does that impact our employee turnover? I believe it creates more autonomy for the individual as they see, understand, and choose the pace of their own development – and the rate of their won raises. Instead of telling the team member to be engaged, we are providing person enrichment, which results in engagement. These different certifications are recognized through different color hats. As pictured below you see we have team members in tan hats, (rookie level) red hats, (pro level) and not pictured black hats (expert level). Leadership Development Programs. These programs rigorously school team members not merely in specific tasks, but in communications tools they need to perform well both on the job and as people. In essence a Trust-and-Track leader makes the development of others a priority and understands we are here to serve the team and that serves us. They take the extra time to pour into others in order to support their growth. Fiscal Inclusion (…and open books). Open books, fiscal huddles and getting the team involved in forecasting numbers. 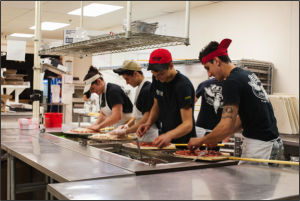 Involve the team members and cultivate ownership in the business. Teach fiscal literacy. Self Awareness. Humility of my emotional intelligence, and willing to work on myself. I often get asked, “What is the difference between Command-and-Control and Trust-and-Track leadership?” Although this might seem obvious the specific details might not be. The real difference is in the questions you ask. It starts with a self-discipline to ask open ended questions. Then we have to build our own skill to ask the most effective question that hits the bulls-eye not just the target and build retention of learning. My primary job on a daily basis is to catch the positive behaviors that show up from our team and celebrate them. Then, ask questions of every level of system to see what a team member is tracking or a leader is anticipating. As an example, James (A member of our leadership team)- What is your focus for today’s shift? What do you feel will be the biggest challenge for tonight’s dinner shift? Or to Kelli (one of our host trainers) – What should your trainee be doing to stay productive in-between guests coming in the door? What will you pay attention to – to anticipate the rush? Or to Benito leading our Heart of House (what we call our kitchen) team for the evening- What are you going to do to support fast ticket times from the team? What are 3 things you will track to anticipate the next rush? I could go on and on with many examples here. The bottom line is being specific to develop the ability to anticipate behaviors that you want to see more of and recognize them in the moment when they happen. What is also very important is for each of us to have a good level of patience to develop and train our team. This type of questioning process will no doubt take more time than “telling” a person what you want done. I can’t emphasize enough how ineffective just “telling” can be. Unless of course being handcuffed to that position and that business is something that you want. The opportunity for us as leaders is to inspire the people we work with, and watch them grow and develop into amazing people! Originally published on Nick Sarillo's blog.